It seems like we have a peacock theme going on in our house right now. I'm sure all the work we've done designing Big Sis' bedroom in peacock décor, influenced Little Sis to want to be a Peacock for Halloween. There were some peacock costumes and accessories out there, but costumes can be so expensive! Some of the accessories were even more than the costume itself. Even peacock feathers can be expensive. 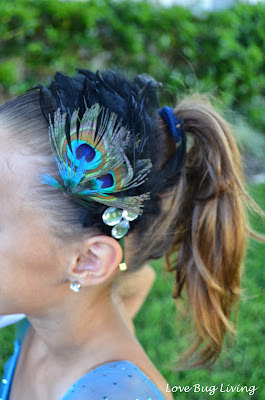 So I was looking for a way to create the peacock look, but on a budget! We have a pretty good supply of old dance costumes from all the years the girls have participated in dance recitals. Those suckers are expensive too! Any time we can reuse an old costume is a way to get a little more bang for the buck out of them. Luckily, we happened to have a teal ballet costume that was the perfect base for a peacock costume. It just needed a bit more to complete the look. 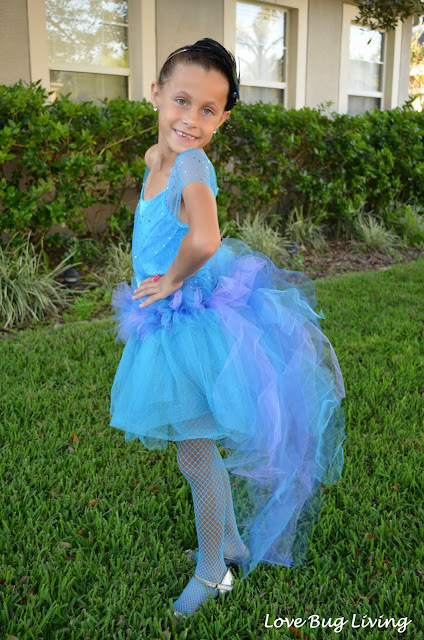 If you don't have a teal costume, you could always wear a blue leotard or even t-shirt and shorts. You will start by cutting a piece of skinny elastic that fits around your child's waist. You can either safety pin the ends together or tie them together. I used a combination of dark blue, teal, and purple tulle to create my tutu. 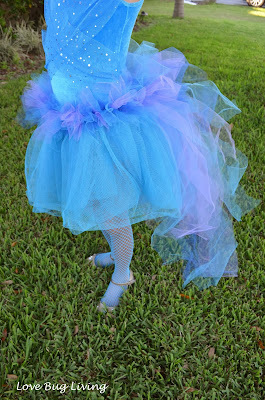 Cut your tulle into long strips. The width of the material is probably a good size depending on how tall your child is. 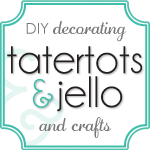 Alternating colors, tie your strips of tulle onto your elastic on to the back half of your circle of elastic. The pieces should reach down to around your child's calves. This will be your peacock tail. 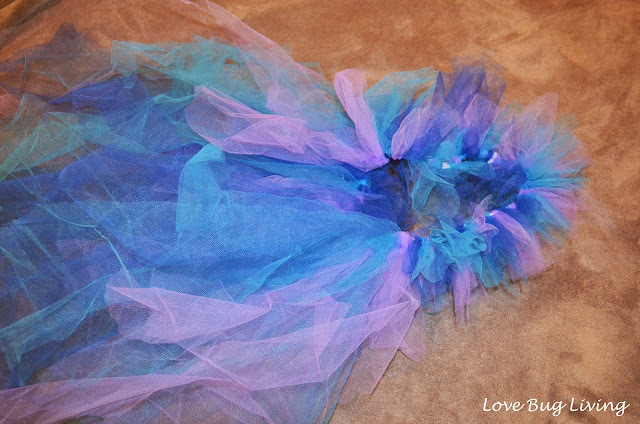 For the front of your tutu, you will cut your pieces much shorter. Continue alternating your colors and tie these shorter pieces around the front half of your elastic. 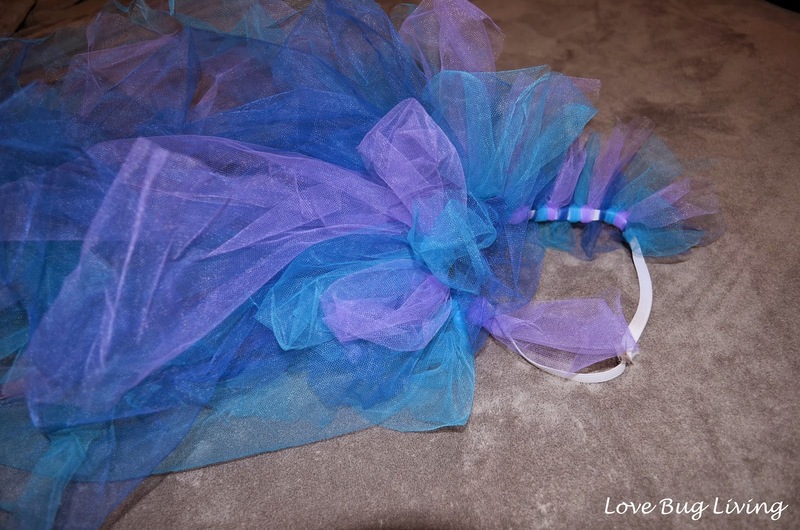 Make your tutu as full as you want, tying strips until you are happy with it. Remember your elastic will stretch some and may leave some empty spaces if you do not have enough strips. Your peacock tail tutu is now ready to show its feathers! Need another accessory? Simply glue a peacock feather or two to a headband and your child will be ready to trick-or-treat!